The Turbo Aerator KTF 5000ä is designed for wastewater treatment, food and beverage, pharmaceutical, and chemical processing applications. 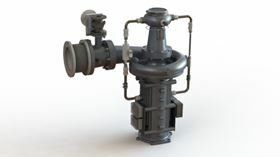 The company says that unlike conventional compressors with lubricated gearboxes, the Kinetic Turbo Aerator uses a single shaft coupling the impeller and direct drive high-speed permanent magnet motor eliminating oil carryover contaminates in the air compression process to comply with ISO 8573 and ISO 12500 quality standards. With only one moving part, the Turbo Aerator employs a direct drive air cooled permanent magnet motor, self-diagnostic active magnetic bearings and controls, high efficiency impeller and variable frequency inverter with optimized algorithms for high speed rotation and compatibility with plant SCADA and interface connections. The Kinetic Turbo Aerator is claimed to offer 60% flow turndown resulting from an efficiently designed impeller and labyrinth seal using computation fluid dynamics and 5-axis machining of flow path components. US-based Pelican Water Systems has announced the release of its Compact Lead/Fluoride Water Filter System.